It’s an old recipe: Mix cream, sugar and flavouring with fresh snow and stir it up to make a yummy dessert. 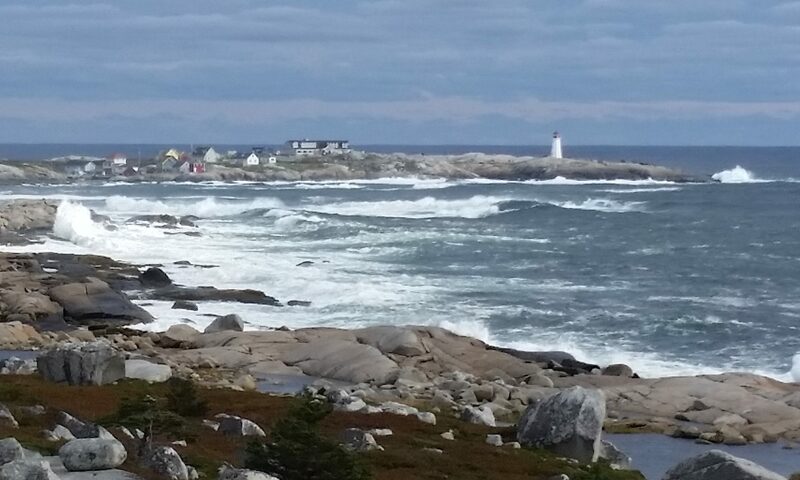 We have lots of the main ingredient since Snowmageddon hit Nova Scotia on March 18. It tickles me pink to have some of the stuff in the freezer, waiting for the day when I can give summer visitors a literal taste of this winter. Today, before rain turns the fluffy snow to slush, I made a couple of batches. I chose a drifted snowbank on the shady side of the house and removed the top crust that has formed since last week’s big snowfall in order to get at the fine-grained powder beneath. I filled a big bowl with it. 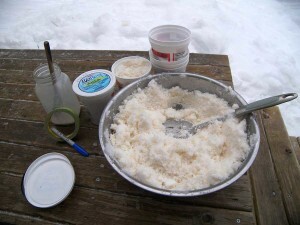 I had already combined the other ingredients, and stayed outdoors to mix them with the snow so it would stay cold. For freezing, I made a light fluffy product, not creamy like ice cream. In a previous batch, I used more cream and less snow. It was more ice cream-like at the time, but after being in the freezer it froze hard and wasn’t very scoopable. It would be fine if you eat it right away. I think we’ll be very happy to eat fluffy sweet snow in the heat of July. If we really want ice cream, we can always buy some! All measurements are approximate. You really can’t go wrong. Combine everything except the snow until smooth. Drizzle over the snow, then mix it all together gently. If possible, do this outdoors so the snow crystals don’t melt. Serve immediately, or put in plastic containers to stay frozen until summer. Maple: omit vanilla and use 1/2 c real maple syrup instead of sugar. If you can get amber (dark) maple syrup, with its rich flavour, use it! Incredible. Chocolate: Add 1/4 cup chocolate syrup. Mocha: Add 1/4 cup cocoa powder and 1 teaspoon instant coffee. Strawberry: Add 1/2 cup frozen strawberries and blend well with the milk before adding to the snow. Get creative! The possibilities are endless. You can use milk substitutes: soy milk, almond milk etc. Use sweetened condensed milk and omit sugar.